I booked my Solo Together trip with srprs.me, received my envelope, contacted my fellow travellers on Facebook and made my way to the airport. Finally, something to cross off my travel bucket list! I had heard so many amazing stories about this city and seen some beautiful pictures, so naturally, I was excited. 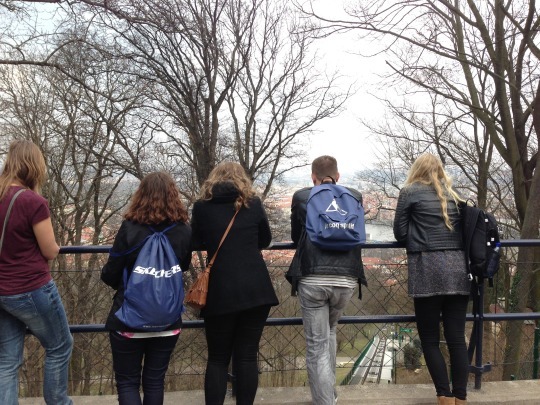 None of us had been to Prague before, so we could go and explore it all together. After a short flight and a long taxi ride, we arrived at our hostel: Mosaic House. Honestly the fanciest hostel I have ever seen. It’s a concept hotel with both private rooms and dorms, a really cool bar and just outside the city centre. As it turned out, we would be sharing an eight-person ensuite dorm. Let’s just say it was “cosy”. Of course, we immediately went to out to wander around the city. I was not disappointed! Prague is truly stunning! Prague has a beautiful combination of architecture from different era’s, with medieval, renaissance and baroque building standing side by side. Most of our time those four days was spent just walking around, taking in the sights. I would especially recommend walking up the hill on the west side of the city as it offers some spectacular views. And eating, o boy, does Prague offer some tasty treats. As a fan of Eastern European cuisine, I enjoyed the hell out of some potato pancakes with Sauerkraut. The best thing, however, was the Trdelnik. These delicious pastry rolls sprinkled with cinnamon sugar are made to order on every street corner. They reminded me of a campfire, Christmas and churros. So freaking good! You can read more food tips in my next post. Prague is also known for its nightlife, especially among British hen- and stag parties. The city is home to Europe’s largest club and an impressive amount of pubs and bars. As luck would have it, the second night of our stay was St. Patrick’s Day, which we merrily celebrated with a few of the aforementioned stags in an Irish Pub. A combination of green beer and live music led to a fun night. We spend the first nights enjoying live music at the hostel bar and joined a pub crawl the last. I always enjoy these pub crawls as they are a great way to meet some new people and give you a good deal on a wild night out. After throwing back free shots left and right, we ended the night dancing to the different tunes of the five floors of the Karlovy Lazne club. The third day we opted for another laid back day of sightseeing and culture. We split up into smaller groups and I convinced a few of my companions to visit the Alphonse Mucha museum. Mucha was an Art Nouveau painter (you could even say THE Art Nouveau painter) from Czech and one of my all-time favourite artist. The museum houses some of his most famous pieces, such as Sarah Bernard theatre posters. It also provides a great deal of information on Much as an artist and a person. Truly fascinating! Slightly hungover, but very satisfied we embarked on our journey home on Sunday. After saying our goodbyes at the airport we promised to stay in touch and meet sometime soon. But although we had a great time together, I doubt that will actually happen. All in all, I had a great time in Prague. I will post some specific tips for sightseeing, food, and culture in Prague soon.